Everything on this site is copyright ©2013 by Allen Cobb. All rights reserved. The Rules (for the game of life) That “voice in your head” has something new to tell you. A novel, a parable, a glimpse into one man’s internal dialog, revealing unexpected rules from an unverified source. His life is punctuated by tantalizingly cosmic insights — from God, from an alter ego, or possibly just a big misunderstanding. The Rules takes the reader far from the usual homilies and aphorisms into a surprising existential form of spiritual clarity, where expectations are up-ended, and theology is boiled down to its essentials. Notions of “how it works” become intimate and personal, brought down to earth but at the same time revealed in a quiet grandeur that transcends much of conventional thinking. The Rules is a light-hearted journey into a new vision of the sacred permeating the mundane, offering inspiration without sentimentality, realism without emptiness. 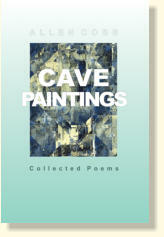 Cave Paintings — Collected Poems Composer, photographer, installation artist, sculptor, inventor, essayist, and poet, Allen Cobb has written of his inner and outer experiences for half a century. This collection reveals the wide variety of styles and idioms of the inner world -- the cave of the human interior. These poems emerge from spaces seen by the poet through many eyes and many epochs, laced with humor, understanding, and surprise. Brain Frieze: ‘Barnaby Goes Home’ and 20 more stories of humor, mystery, sci-fi, and the mind Discover diverse worlds of imagination and surprise in these twenty-one new short stories from the author of "The Rules" and "Cave Paintings." Allen Cobb's best recent short fiction explores the busy characters of New York City, the mysteries of life and death, voodoo in New Orleans, an aging motorcycle and its boomer owner, an extraordinary Doberman, mysterious sleep disturbances, and a short but sympathetic interview with a zombie. Cobb's writing style is compelling and literate, and he manages to make the trivial or absurd unexpectedly fascinating, while handling complex or abstract ideas (life, death, religion, memory) with ease and clarity. The collection is wonderfully varied, from extremely short (especially the 11 tiny stories in "Writing in Restaurants") to the grand entanglements of "16 Degrees of Correlation." Every story takes the reader someplace new and surprising, yet they all share an underlying insight into the mysterious and indescribable realms of the mind.